One of the most difficult careers in the world is to be a part of the glamorous, celebrity world out there. That is the world of film industry! With uncountable challenges and a set back at every step, getting a career in the television or film industry is the toughest thing. But if you have the right information and complete knowledge about this industry then you can enter into the film industry without experiencing much difficulty and challenges. So, if you are looking for complete information about navigating your way towards getting a fruitful career in the entertainment industry, then reading this post will be highly fruitful for you. So, before you dive into the details of getting your job in the film industry, you first need to have a clear idea about the type of career you are looking for! You must first begin by narrowing down your search for a suitable career choice. There are numerous career options available in the entertainment industry. Most of these career options are lucrative and can help you fulfill your entire dreams. So, before you start looking, you must have a clear picture of what you exactly want. Here are some of the promising career profiles that you may consider as your career choice. Once you have selected your career choice, you need to select for the sort of schooling your professional career requires. Do you need to analyze the set of skills you are good at? One great thing that you would be amazed to know is that to be the part of the film industry and to get a job in that sector, you don’t need to possess any specialized skills or training. Most of the training offered to such individuals is during the course of the job, and hence, there is no actual substitute for it. Assessing your skills can help you figure out the type of career which is best for yourself and is appropriate according to your abilities. Also, you lack having proper experience in the field, so evaluating your skills will only bring good results to you. First, you need to identify the skills that you are good at. If you want to get a job in the film industry, then you need to search for the innate skills that can help you get a job easily in this sector. You might have taken numerous classes or have attended schools in order to get valuable knowledge and develop skills required in this industry. As you hone your skills set, you will be able to identify the skills present within you and move forward towards your career path. Once you have identified your set of skills, you may then check for the various career options in the film industry that best meets your requirements and skills. 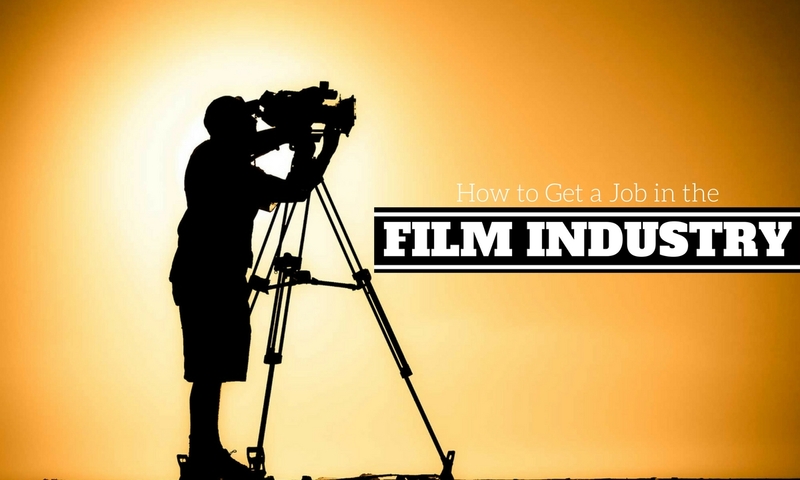 Now, once you have analyzed your skills and you have decided for a career option in the film industry, then you may follow these steps in order to land to your first job in the film industry. So, let’s get started! Having an enthusiastic and positive attitude no matter how difficult the task seems will help you go a long way. Make sure you develop a positive attitude towards the entire process and consider it as an opportunity to learn about new things as well as to enhance your networking skills. Use your initiatives in order to know about the things that you were not aware before. To land successfully into a job in the film industry, you must jot down a plan for success. Getting the right mindset and working accordingly will help you develop an approach required to achieve the long-term success that you have always desired. Your success plan must break down the old paradigms and present to you a novel way of considering film making as a reliable subject. You must prepare yourself mentally towards achieving the success goals and practice things accordingly. This is something needed for those who wish to be scriptwriters. If you want to succeed as a scriptwriter in the industry, then you need to showcase your potentials as writing scripts. You need to present to the world, how successful you are at writing impressive and qualitative scripts. So, if you wish to become a scriptwriter, you may write scripts. On the other hand, if you wish to be a director, then prepare a small group and then direct short films. This is a way to present your skills to the people out there. Industry experts will take you more seriously when you can show them that you are passionate about the things and career profile that you are talking about. When you are networking with others or you are involved in an interview situation, then you must be able to explain about yourself. If you desire to work in the camera department, or wish to be a director, or intend to write scripts, then you must possess the necessary skills and passion for the same. The set of skills you possess will make a great difference to the entire team. If you are aware of yourself then you will be able to tell about it to others as well. Also, this will help you create a compelling pitch that can generate and gather interests of others. Once you are done with making small films or videos, you may then share the videos with the others. This is one of the best ways, to begin your film making career. You can share your own personal stories in forms of films. If you are able to create personal projects that are compelling then you can attract customers. Even you can share the videos on your social media platform in order to gain recognition among wider customers online. In order to legitimize your video production business, and create a solid online presence, you need to develop your own unique image. Creating a powerful image online will be supportive in targeting your preferred job and will also help you fetch your clients easily. A stronger self-image and robust online presence of you can get a job in the industry. No matter to which industry you are interested in, the first impression always matters and often the first impression is always on paper. Yes, I am talking about your CV. It is essential for you to prepare a CV that is clean, well-written, easy to read, free from errors, and simple. Your resume must include only relevant information that can help you land your desired job. With an impressive cover letter, you will be able to expand your chances of getting hired. Even you will be able to convince others, that you are fit for the position. Interacting online is even more important now than before. This is essential to identify suitable jobs and opportunities, keep involved with the prospective employers, and usually stay up-to-date with the norms and environment of the film industry. Also, social channels can offer you to look out for the last-minute jobs and will even provide you with a sense of feeling involved with others. Networking is not as difficult as it might seem to you. You just have to grab a drink and introduce yourself to others. While introducing, make sure that you ask relevant questions about their profession. If you are offered with a useful business card, then getting a job in the film industry will be easier for you. Be sure about identifying genuine personalities. Also, before you deliver more information it is essential that you gather more and more information about them. This will help you land a desired job in the industry. After so much effort you are trying to get a job that will pay you monetary returns. You can follow one or all 4 ways in order to get a job that actually pays you sum. Another major step that you need to follow is to get clients and retain them. Retaining clients is important to ensure that you avail consistent growth and can expand your horizons in the film industry. You can get consistent work only if you are able to deliver regular services. Also, make sure that you deliver solutions that the people will love. These are the only ways that can help you land a job that is rewarding from all aspects. If you want your business to reach next level, then you need to protect yourself as well as your business by incorporating appropriate techniques and ways. You need to practice adequate ways to ensure that you are paid for what you actually work. You may use contracts before beginning with the work or can work out an agreement stating all the terms and conditions to feel secured about the payments and work in a hassle-free and stress-free environment. While landing and retaining clients is very much important, it is even more essential that you build up strong communication between everyone around you. No matter to which profession they belong, if they are in the film industry, then they might be able to help you in one way or other. In such a case, you must develop strong communication with them so that you can ask for work, support, or other help as and when you need. The entertainment and film industry has lots of fraudulent involved in the business. While you may find it easier and hassle-free to get into direct contact with experts in this industry and land to a job, it is essential that you stay away from any exploitation. There are lots of unpaid work around. Even if you can afford small frauds, still it is advisable to simply avoid it at any cost. Make sure that you not working on an unpaid basis for more than 4 weeks. After completing 4 weeks your employer must pay you at least the minimum wage. Your employer must meet your basic travel expenses. You must be provided with initial training and other necessary resources that are required to get the job done. One powerful way to network and build connections with others is to attend free screenings, launches, and events, which you might never be able to attend on the paid basis. Once you get the screening and you are able to meet familiar faces twice or thrice, then this will even help them recognize your identity. Also, you can connect to people, ask queries, and identify ways in order to know what they do and how they do. While the film industry is definitely the toughest to crack, but the good thing is that most of the people involved in it feel happy to give necessary advice! These tips can help you get a job in the film industry to a great extent, staying patient, persistent, and passionate about your goals will help you to turn out all the odds and gain success in the industry. Previous articleText or Visual Resume: Which One Grabs Recruiter Attention?